In a neglected Northern city riven by criminal gangs and rife with drugs, two small time gangsters, Tariq & Boxy, are given an ultimatum by the local Godfather – find their missing boss Frank and return the drug money he’s stolen or be battered to death with a cricket bat. A task made even more problematic once we discover Tariq & Boxy accidently killed Frank a few days before. After several unsuccessful attempts to find the money, Tariq hatches a desperate last ditch plan. A local psychic medium, Alice Moon, has been helping police locate bodies hidden by a notorious serial killer. Tariq persuades Boxy to help him kidnap Alice and force her to make contact with Frank. 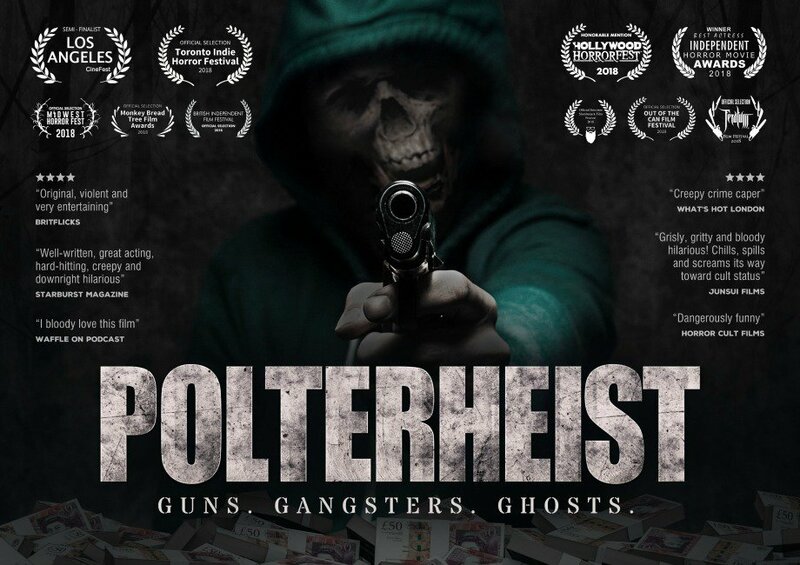 Following a bizarre and terrifying séance, Frank’s poltergeist possesses Alice’s body and persuades Tariq & Boxy to replace the missing money by robbing a rival drugs gang. But the heist is bungled and sparks off a bloody gang war. Frank, still in control of Alice’s body, continues to lead the hapless pair on a merry dance through the city’s dark underworld. 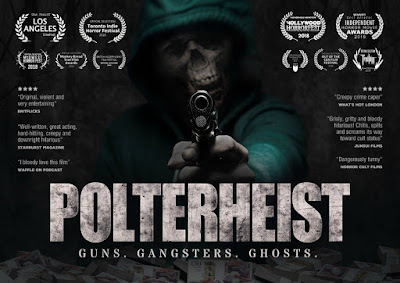 It’s a journey that ends in a vast, run down Victorian cemetery where Frank has planned a final brutal act of revenge on the men who murdered him…but like all the plans in Polterheist, this one has unseen and unpleasant consequences.